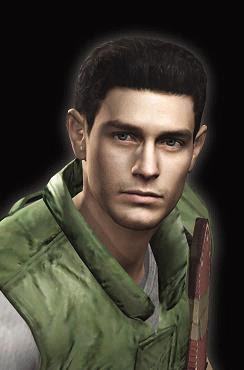 I was playing Resident Evil Code: Veronica X a few years ago, when my brother walked in, picked up the game case and asked, "Who the hell is this guy?" It is a bit of a shame that the stars of Capcom's biggest franchise seem to lack consistent identity across the generations. People sometimes make fun of Tetsuya Nomura's designs, but the reason Cloud Strife's hair is like that is so that you can always identify him, no matter how drastically his face changes over the years. Leon S. Kennedy has a bit of that, but the other RE protagonists have at times been recognizable only by the colors they wear (Chris-green, Jill-blue, Claire-red). 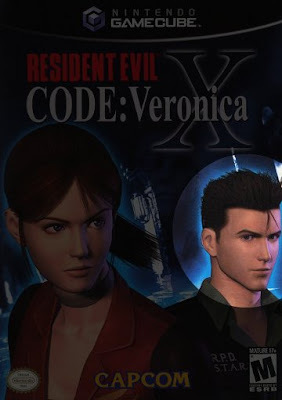 It wasn't until Code: Veronica on the Dreamcast that the characters could even have actual faces outside of cut scenes. Then, realizing that the GameCube could do better, Capcom scrapped all that and seemed to have finally set out to establish a consistent look for the characters across the remake, RE0, RE4, and later even Umbrella Chronicles for the Wii. I still remember forum fools misidentifying him as Carlos Oliviera from RE3, or even Bruce McGivern from Resident Evil: Dead Aim. 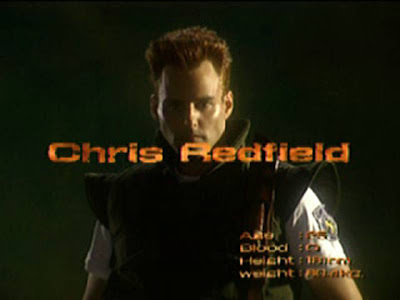 I could not believe I was hearing such ridiculous suggestions, but most people (those who actually cared about the characters of Resident Evil) thankfully had sense enough to see, as I did, that it was obviously Chris. Of course, it was obvious only by the process of elimination--it was clearly a guy, and it definitely wasn't Leon, so it had to be Chris. 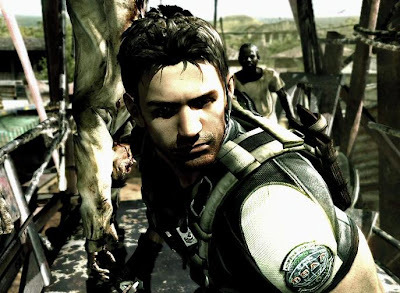 Capcom was not even close to announcing a release date for RE5, and it wouldn't have chosen just some random spin-off guy or minor supporting character to be the image to get fans pumped up in the meantime. But if that shot had been handed to me with no context or exposition, then no, I wouldn't have guessed that that was Chris. Capcom had again reset the designs of the characters, leaving many fans scratching their heads over what they were even looking at. He wasn't even wearing his signature green color. 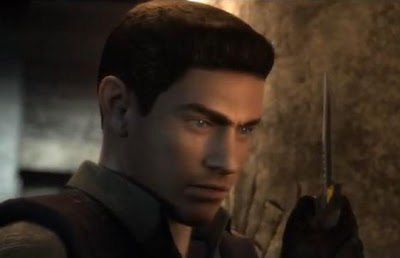 Comparing him against the GameCube Chris, maybe RE5 Chris inherited some of the brow and jawline. Better hardware added some stubble and better definition to the hair. But I could understand if people had a hard time recognizing him. 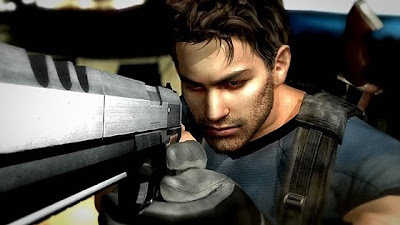 Although Chris would not have a large role in Resident Evil: The Darkside Chronicles, one of the things I was actually most curious about was how, in essentially last-gen graphics, they would handle his character design in light of his new RE5 look. What form would this potential missing link between GameCube Chris and HD Chris take? But again my brother was left shaking his head. I suppose this time it was the 'roided-out RE5 Chris that he had grown accustomed to. When you get right down to it, only Wesker really endures as the face of Resident Evil. Although he is traditionally regarded as the tank among RE protagonists, he is not without moves! Of course, sometimes muscle is what's called for, and Chris has got what you need. What could Leon have done to get out of this one? I would have thought Leon a more suitable role for Wentworth, with Chris being more a Dominic Purcell kind of character, but Miller's face is not too far off here (not that I expect movie Chris to resemble game Chris in any way). This is a real travesty in so many ways. Am I the only one who sees this? None of the Chris versions look alike, first of all. Secondly, neither of the Prison Break dudes makes a good Chris. You may as well hire Theodore Teddy T-Bag Bagwell Sac! I don't see why the movie Resident Evils even bother with including any characters from the games. I'm certain that the only reason for it is laziness, since it spares them from having to create new characters. But the main character is already original to the movies; why pollute the image of the game characters by surrounding her with them? And what were those clowns doing in that video on set? Keep it in the trailer, you perverts! Apparently this guy is going to play Wesker. No set photos yet, but hopefully he'll at least be better than the fat and dull Wesker from the last movie (although that dull Wesker went on to be pretty good as the lead dude in ABC's Life on Mars). "And what were those clowns doing in that video on set? Keep it in the trailer, you perverts!"